A little bit better than previous LMDHP record, but in the same vein: melodic prog with jazz and funk elements, and with some beautiful tracks (the complex instrumental "Obertura 777" and the both melodic and relly nice "Marylin..." and "No Te Dejes Desanimar"). If you are listening the album, you can use the remote control button and jump from track 3 to "Ruta Perdedora", another very good theme. Remaining cuts are average, except the particularly ugly song "El Vendedor de las Chicas de Plástico". It makes the rate go down. Neverthless, "Peliculas" is the highest point in the brief La Máquina... history. Talented musicians and potentially a great band, but I believe they stayed halfway. During those years, Charly Garcia, the group leader, declared in an interview: "LMDHP is the Argentinian Yes". Don't believe him. La Máquina de Hacer Pájaros achieved an excellent second album, that was to become their musical "last will". Such a pity... since it is obvious that the band members managed to compenetrate with each other more fluidly, and the overall sound became tighter, daring to input a larger degree of sophistication in the compositions and arrangements. In fact, the band manages to work more solidly as such, since the individual members feel freer to show their own abilities, and the writing is not exclusively managed by García anymore. 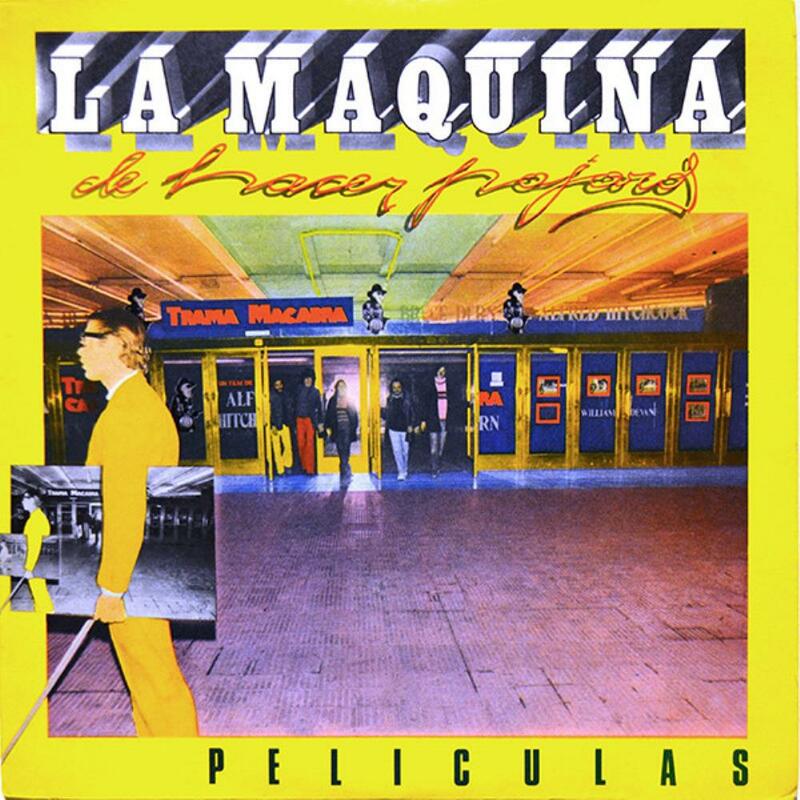 As a whole album, you can clearly notice that 'Películas' enhances the jazzy aspect, even with some notable latin-jazz touches, which helps to build a special flavour in addition to their symphonic leaning. It is obvious since the laid-back instrumental opening number, and it gets even more intense in tracks 4, 5 ('Hipercandombe' is a stunning, hard rocking piece written on a African-Brazilian rhythmic basis), 6 (a cynical sexual satyre 'El Vendedor...' that sounds like something played in a piano bar in a comedy movie scene), and the explosive 'En las Calles de Costa Rica', a Bazterrica penned number very much influenced by the best Di Meola-era Return to Forever, that ends the album with pure fire. The emotional 'Ruta Perdedora', one of the most beautiful pieces in Argentinian prog history, meets the best of both worlds: symphonic keyboard layers and conterpoints, and a melancholy twist in the jazzy rhtyhm section during the instrumental closure. For the listener who understands Spanish, the lyrics will resound as an overwhelming testimony of self-pity and extremely emotional confusion: a letter from the darkest side of García's mind. The symphonic thing is more prominent in tracks 2 and 3, which alternately explore the most somber and the most playful side of García's own persona, respectively: the former, loosely inspired by Marilyn Monroe's tragic figure, features some sinister Moog lines over the disturbing guitar-and-bass riff that comes near the closing climax, while the latter includes some stylish string arrangements that properly enhance the optimistic candour conveyed in the lyrics (an "always look at the bright side of life" kind of thing). Like many other connoseurs of Latin America prog, LMDHP is not one of my top 3 fav Argentinian bands, yet there's no doubt in my mind that 'Películas' is a very good album - sure it doesn't have a 8+ or 10+ minute suite in it, but it certainly contains plenty of good and well performed musical ideas. Like the previous album ... this is a virtuosic and progressive album that needs repeated listens to grasp the beauty of it. This one is more influenced by jazz though. Unfortunately, this album is not as strong as their debut: the melodies are not as memorable. It is a very enjoyable progressive rock album with excellent musicianship. "Overtura777" starts the album in a great note. It is a complex instrumental piece with great melodies and musicianship. "Marylin" is a nice melodic track with a powerful finale with electric guitars, moog synths, and energetic rhythms. " No Te Dejes Desanimar" is more symphonic than the previous track and features a small orchestra. "Que Se Puede Hacer..." is a jazzier track with some excellent instrumental breaks and a great main melody. "Hipercandombre" is a hard rocking piece full of riffing and is played over a very interesting rhythm, phenomenal track!! "El Vendedor" is weaker in quality than the others, yet is enjoyable in its own... it has great bass guitar work. 'Ruta Perdedora' is another highlight : a symphonic jazz-rock piece with great lyrics/melodies, nice musicianship and great arrangements. "En las Calles de Costa Rica" is a powerful instrumental finale. A cross between the flamenco tinged symphonic prog of mid 1970s Spain and a certain Latin American jazz sensibility, La Maquina were 6 skilled musicians that produced this eclectic album. From the appealing opening instrumental "Obertura 777" to the overtly romantic and Italian sounding "No Te Dejes Desanimar" to the soft jazzy ballad "Que Se Puede Hacer Salvo Ver Peliculas" to the very bass dominated "En Las Calles De Costa Rica", the album has wide cross over appeal. The mix of keyboards and guitars is well balanced, as are the variations in tempo. What it lacks is a piece that really grabs me and gets me to return back regularly for a visit. Nonetheless, many fans here would enjoy this, hence the good rating and special recommendation for fans of the various sub-genres upon which La Maquina touches. La Maquina de hacer Pajaros. This record is more eclectic and ambitious than it's predecesor but , in my opinion , it does not have a standout tune like Ah te vi entre las luces. However it's a really enjoyable release. When comparing it to the first record one first realizes that Peliculas is much calmer and jazzier. The first track is an instrumental called Obertura 777. It satrts with an acoustic intro and then has a subtle funky beat , it sounds like smooth jazz sometimes. The second track Marilyn , la Cenicienta y las Mujeres reminds me of Garcia's following band Serú Girán. It's a sophisticated rock song including synthetizers and a little chorus. No te dejes desanimar is one of the highlight's here: A majestic ballad with very interesting vocal harmonies , delicate piano playing and some violin that reminds me of Gentle Giant like another reviewer stated. Que se puede hacer... starts like a Santana song , and you can tell Charly's growing appreciation in this song and the following Hipercandombe. "El vendedor de las muñecas de plastico" sounds like a progressive tv advertisement. It's hilarious!! Ruta perdedora is another highlight here , it has emotional lyrics and impressive synthetizer sounds. The record finishes with the jazz -fusion like instrumental "En las calles de Costa Rica"
This record shows us the transition between La Maquina de Hacer Pajaros and Seru Giran , and in spite of not having epic-size tracks it's a very well composed album full of interesting ideas. Post a review of LA MÁQUINA DE HACER PÁJAROS "Peliculas"